That is, when competing explanations for a situation are equal in other respects, we should prefer the one that uses the fewest assumptions and entities. This principle is almost universally known as Occam's razor, though there is no evidence that William of Ockham was it's author. The phrase Occam's razor did appear in 1852 in the work of the Scottish philosopher Sir William Hamilton (1788--1856) , but William Thorburn in 1918 showed that the wording of the classic formulation of Occam's Razor, as given here, was not medieval at all but a `modern myth'. In fact this formulation was originated in 1639 by John Ponce of Cork, a follower of the medideval philosopher Duns Scotus. This principle is referred to as a razor because it stresses the need to shave away unnecessary assumptions to get to the simplest explanation. In science, Occam's razor has long been referred to as a heuristic minimal principle, or law of parsimony. It is still used by scientists as a rule of thumb in the development of models, but rarely used to make a qualitative or quantitative choice between alternative models. Thorburn, W.M. (1918). The myth of Occam's Razor. Mind. 27 (107) pp 345-353. Full text of the paper and an introduction HERE. The image of a razor blades edge is from Robert Hookes Micrographia published 1665. Robert Hooke (1635--1703) was a polymath scientist, an early member of the Royal Society and it's Curator by Office, responsible for putting on regular experiments for the fellows of the society. 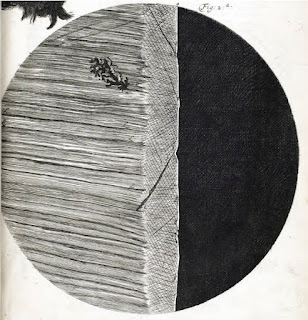 Hooke also wrote and illustrated the Royal Society's first book, Micrographia, which was published in September 1665.